Much ink has been spilt over the last year on the subject of the MacBook Pro. In short, Apple hasn’t given its professional laptop lineup a real overhaul in some time. Only the smaller 13” model ever got Intel’s 5th gen Broadwell CPU – the 15” model is even further back, on 4th gen Haswell – and otherwise the laptops haven’t had major feature updates since 2013. As a result, Apple has been due as anyone can be to update their laptops. And at a special event held at their campus this morning, they have done just that, launching the 4th generation of the MacBook Pro. For better or worse the new 4th generation family doesn’t have a catchy name like Retina to help set it apart from the prior models. But make no mistake, Apple has been busy on giving their languishing laptops a much-needed facelift. All-told, Apple has introduced 3 new MacBook Pro models: a basic 13” version, and then two full-featured versions at 13” and 15” respectively. All three models are form the same mold, so to speak. All of them get the same new unibody design, the same wide color gamut (P3) display, and the same upgraded internal hardware composed of Intel’s 6th generation Skylake CPUs, Thunderbolt 3, and new SSDs. What separates the basic 13” from the other two models, besides cost, is that it doesn’t include Apple’s new multi-touch Touch Bar (more on this in a sec). Model 2015 15" 2016 13" (basic) 2016 13" (touch) 2016 15"
If you’ve been watching Apple over the years, then you know that the company has a (sometimes unhealthy) obsession with reducing their products’ thickness, and the 4th gen MacBook Pro follows that obsession to a T. The new family of laptops is thinner than ever, with Apple taking them from 18mm to 14.9mm and 15.5mm for the 13” and 15” models respectively. Altogether, the total volume is down 23% for the 13” model and 20% for the 15” model. Apple is still using their now tried-and-true aluminum unibody design for the family, so if you’re familiar with the current color-coated MacBook, then you know what to expect here. Though the event was very brief on how Apple was able to shave off so much volume compared to the last generation, it sounds like they’ve gone with a thinner cooling system, and in the case of the 15” model, AMD’s low-profile Polaris 11 GPU. Under the hood, this change in volume comes without a significant change in official TDPs (so all factors held equal, Apple would be removing the same amount of heat in a thinner design). 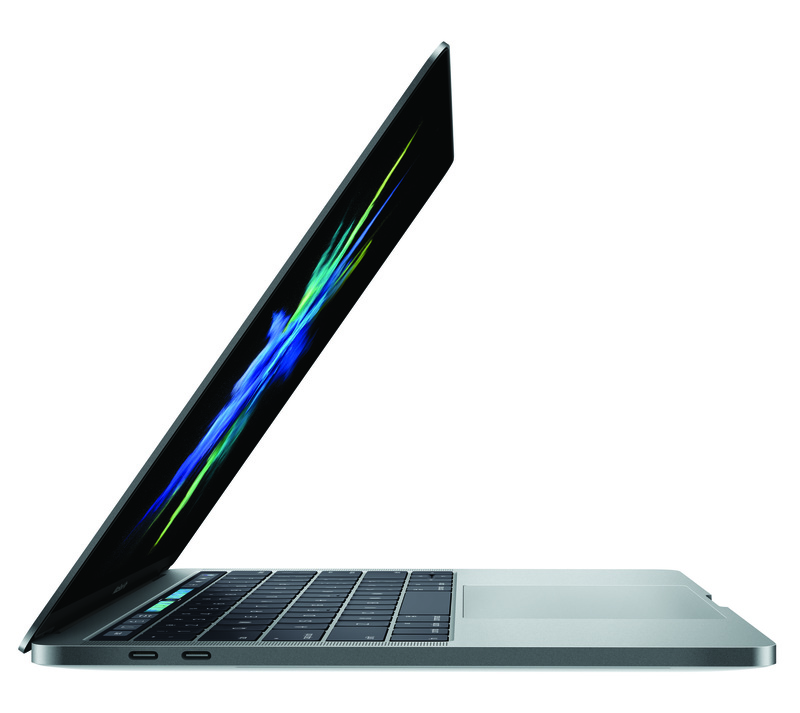 Apple has finally made the jump across the entire family to Intel’s 14nm Skylake processors. The basic 13” model uses a 15W CPU, the higher-end 13” model uses a 28W CPU, and the 15” model uses a 45W CPU, the latter two being the same TDPs as the last generation. Apple isn’t talking up CPU performance too much here, but given how long they’ve been on Haswell on the 15” model in particular, we should see a good performance bump. Meanwhile, in a change from the 3rd generation design, all 15” 4th gen MacBook Pros come with discrete Radeon Pro graphics. Apple has tapped AMD’s new Polaris 11 GPU, in part for the low z-height it offers, which replaces the 4 year old Cape Verde GPU in the previous MacBook Pro. Apple is offering 3 dGPU configurations at increasingly higher performance. From what AMD has told me, these chips are all in the ballpark of 35W. Relative to the previous dGPU models – or even more, the previous model that only offered an integrated Intel GPU – GPU performance should be greatly improved over the last generation. Over 2x for the top-tier Radeon Pro 460 is a very reasonable assumption right now, though one that testing will need to confirm. On the SSD side of matters, Apple has quickly talked up the fact that the new MacBook Pros use a new SSD. Apple traditionally uses multiple vendors, but the quoted 3GB/sec read speeds are consistent with the latest generation of drives out of Samsung and Toshiba. So is the fact that Apple is now offering SSDs up to 2TB in size. More visible is the change to the display. Apple hasn’t increased their resolutions at all – so these are the same 2880x1800 & 2560x1600 resolution configurations at before – but they have upgraded what these displays can do. All of the MacBook Pros now support the wider P3 color gamut that Apple has been championing for the last year and already offers on the iMac, iPhone 7, and iPad Pro. Meaning that the new laptops now support a wider color gamut and can display material mastered for P3 (or photos taken from the iPhone 7) at their full gamut. The new displays are also said to be quite a bit brighter than before; Apple is throwing around 500 nits, or 67% brighter. And, perhaps most interestingly, Apple has confirmed that the new displays support “variable refresh rate” technology. I need to dig into this more, but if this is an implementation of AMD’s FreeSync tech or something similar, then it would potentially be a nice improvement in perceived screen smoothness. Apple’s also touting that the new display consumes 30% less power, but it’s not clear how much of that is due to variable (e.g. lower) refresh rates and how much of that is from panel and backlighting improvements. Apple has also reworked the keyboard and trackpad, in part to integrate the latest technologies and to achieve their thinness goals. 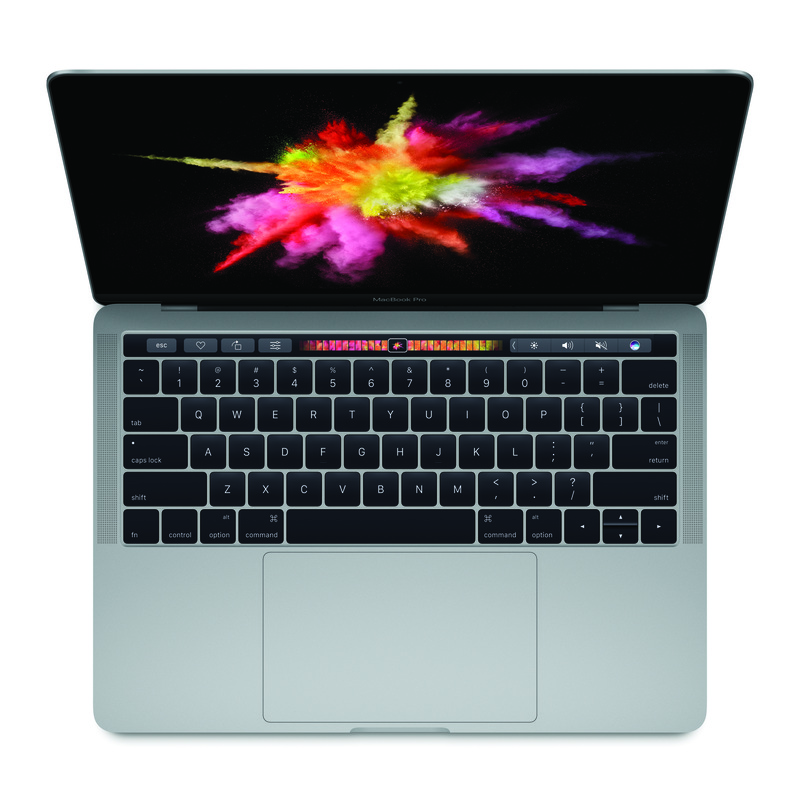 The new MacBook Pros utilize a newer revision of the butterfly switch first introduced on the MacBook keyboard. 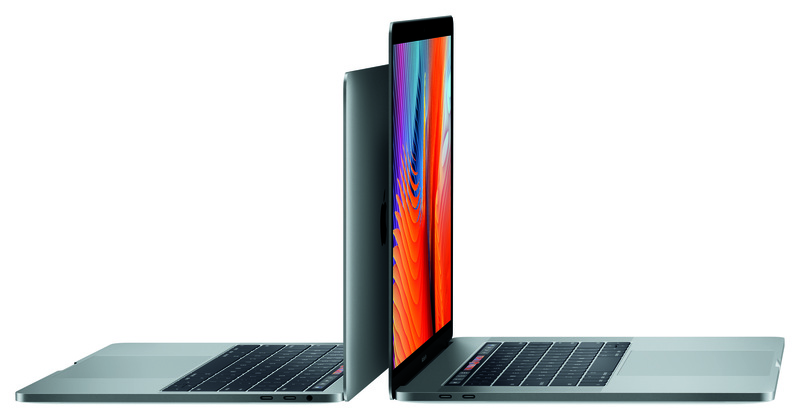 This means we’re talking about a shorter travel distance than the prior generation MacBook Pros – something that may not be popular in all corners – but at the same time we’re told that these aren’t the same identical switches as on the MacBook, and that there have been some changes to improve the feel. Meanwhile the Force Touch trackpad has been enlarged; it now goes from the bottom edge of the laptop to the keyboard, the full area that Apple could hope to give it. This is a 100% area increase for the 15” model, and a 46% increase for the 13” model. Apple has also overhauled their input/output options on the new MacBook Pros; quite radically in fact. Apple has doubled-down on Thunderbolt 3/USB Type-C. All three models contain solely either 2 (13” basic) or 4 (all other models) TB3 ports (which also double as USB-C 3.1 Gen 2 ports), and then a 3.5mm audio jack. This means the MagSafe port is gone, as are the USB Type-A ports and the Thunderbolt 2 ports. In this sense it’s very close to what has happened with the MacBook, except the MacBook Pro gets a larger number of ports. TB3 is enabled through the use of Intel’s Alpine Ridge controller; the 2 port versions have a single controller, and the 4 port versions have 2 controllers (since Intel doesn’t make a 4 port version). Furthermore all 2 or 4 ports can be used for charging or display outputs as necessary, so they are all equals in functionality. Last, but certainly not least however, is perhaps the marquee feature of the 4th generation MacBook Pros: the Touch Bar. A bit of a poorly kept secret in the run-up to today’s launch, the Touch Bar is a (presumably OLED) capacitive multi-touch display that replaces the row previously occupied by the function keys. The idea, in a nutshell, is to make a dynamic row of virtual buttons that can be whatever an application (or user) needs them to be, bringing with it all of the advantages of multi-touch that Apple has developed over the years for their iOS devices. 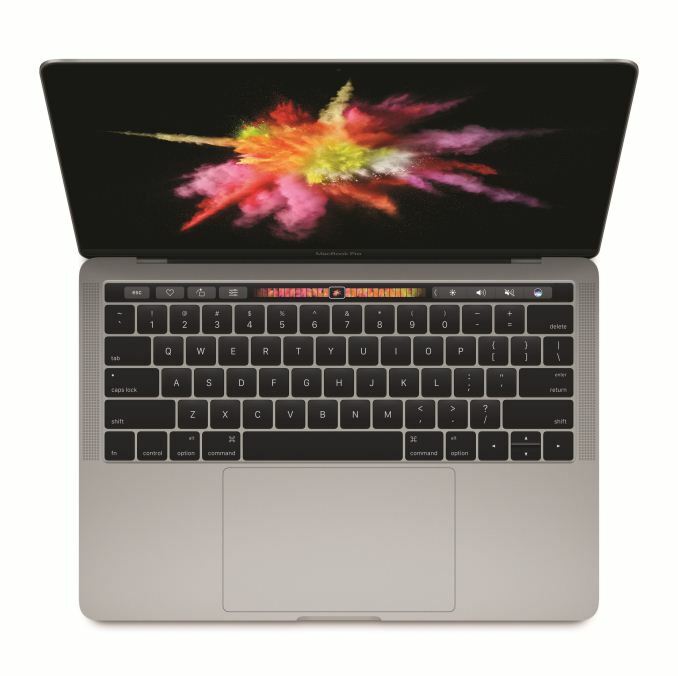 Note that the Touch Bar is only available on the higher-end MacBook Pros; the basic 13” model forgoes the Touch Bar in favor of a traditional row of function keys, presumably for cost reasons. Rounding out the feature set, the Touch Bar also includes a Touch ID fingerprint sensor on its right side, and the necessary controller – what Apple calls the T1 – to handle Touch ID and the Secure Enclave duties. This sensor means that virtually everything that can be done with Touch ID on iOS devices can be extended to macOS: one-touch login, Apple Pay confirmation, etc. You can even use it to do things iOS can’t do, such as swap between users. Taking a page from those iOS devices, the Touch ID sensor is the one physical button that’s part of the Touch Bar; it is both a fingerprint scanner and the device’s physical power button. Judging from the presentation alone, the Touch Bar is going to be divisive among users. Replacing physical buttons with a capacitive strip is a major change; if you’re used to feeling buttons, there’s nothing here to feel. On the other hand, Apple is convinced that the function keys are underutilized right now, and that space can be put to better use. Even with the track pad already offering Force Touch, the Touch Bar has the advantage of being able to display what button it is, and behave separately from the trackpad. As someone who admittedly is still old school enough to configure the function keys to work as actual function keys – and not the screen/sound/playback controls Apple defaults to – I’m definitely going to have to sit down with the new Touch Bar to get an idea of what the transition is like. It’s a bold idea for Apple; but bold ideas can be both good and bad. Wrapping things up, the new MacBook Pros are available for order today. The basic 13” model (the one without the Touch Bar and only 2 TB3 ports) will retail for $1499 and is shipping immediately. The other two models will be at $1799 and $2399 for the 13” and 15” models respectively, and will not be shipping for another 2-3 weeks. Finally, Apple has also illustrated how the overall MacBook family of laptops is organized now that they’ve added the new MacBook Pros. The 11” MacBook Air has been removed from sale entirely, while the 13” model is still for sale, but hasn’t received any update. Given that the new MacBook Pros are thinner than the MacBook Air 13”, it seems likely that it’s going to eventually be phased out entirely. 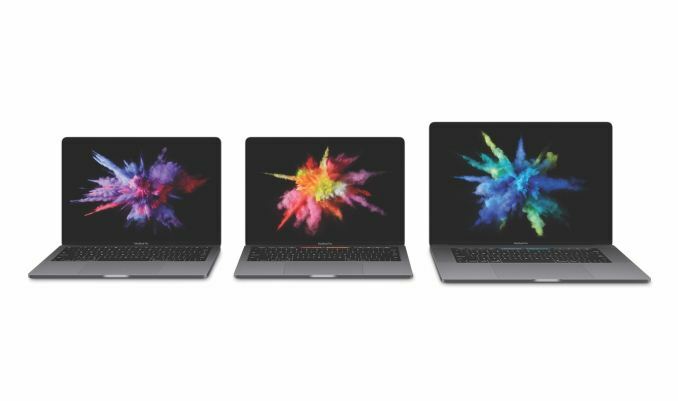 Consequently the new, modern MacBook lineup consists of 4 laptops: the 12” MacBook, the basic 13” MacBook Pro, the advanced 13” MacBook Pro, and the 15” MacBook Pro. What looks interesting is that the 13inch Touch has a 28w CPU + a smaller battery when compared to the non-touch version. Wonder how battery life is going to be affected by that. the 13" pro mind you, or course the 15" got a 45W CPU.. although my current rMBP is using a 45w CPU and a 100W GPU. They cut the GPU TDP quite a bit from when they used Nvidia. Nvidia has a ton of marketshare and pretty tremendous mindshare. CUDA is a proprietary api owned by Nvidia on the other hand OpenCL is an open standard that in the begining was created by Apple, IBM, AMD, Intel and Nvidia. Adobe for instance uses OpenCL to accelerate processing operations. So, OpenCL is future proof. "Most applications or libraries don't support OpenCL" do you have any data to support such a thing?